Stay tuned – there is more to this story! In the fall of 1875, Charles Askew and 68 other male students arrived at the newly reopened University of North Carolina in Chapel Hill, forming its first class since the university closed its doors in 1871. Chartered by the state in 1789, the first commencement at the university took place in 1798, making it the first public university to graduate students. Before the start of the Civil War, the university boasted an enrollment of 456 students. It had established itself as the second largest institution of higher learning in the South. During the war enrollments declined drastically. Financial troubles and political changes forced the university to shut down. Breakfast will be at 7 am, prayers at 7:45 am, dinner at 2 pm and supper at 6:30pm. All students must attend religious worship in one of the churches every Sunday. Students must furnish their rooms with slop buckets. Absences from daily prayers and Bible recitations were to be reported to parents. Tuition was $60 and a dorm room rented for $10 per year. The courses required for the Bachelor of Arts degree included: math, Latin, Greek, French, German, Natural Philosophy, Chemistry, Logic and Rhetoric, Astronomy, Mineralogy and Geology, Mental and Moral Science, International and Constitutional Law, Political Economy, and English Literature. Charles may have been working towards a Bachelor of Agriculture degree, because his coursework included Botany and Zoology. Here is his grade report for the Fall term of 1876. Students depended on the societies to cultivate the personal style and “polish of manners” that won little recognition in the classroom, but which they considered essential to manly character. Chapel Hill was a tiny village where hogs wandered mud-choked streets and cows grazed on campus lawns; yet, when the societies were in session, the place took on an air of self-conscious refinement. The principals in the weekly debates “studied their subjects well,” often more thoroughly than their lessons, while official critics filled the society minute books with sharp commentary that revealed how seriously students approached the contests. College men valued the lessons of the society halls because they would stake their fortunes on verbal persuasiveness and outward bearing. In one of the Philanthropic Society debates, Charles argued on the affirmative side of the question, “Ought the right of suffrage be granted to women?” Wouldn’t that have been an interesting debate to hear? The societies often bestowed honorary memberships on non-students. 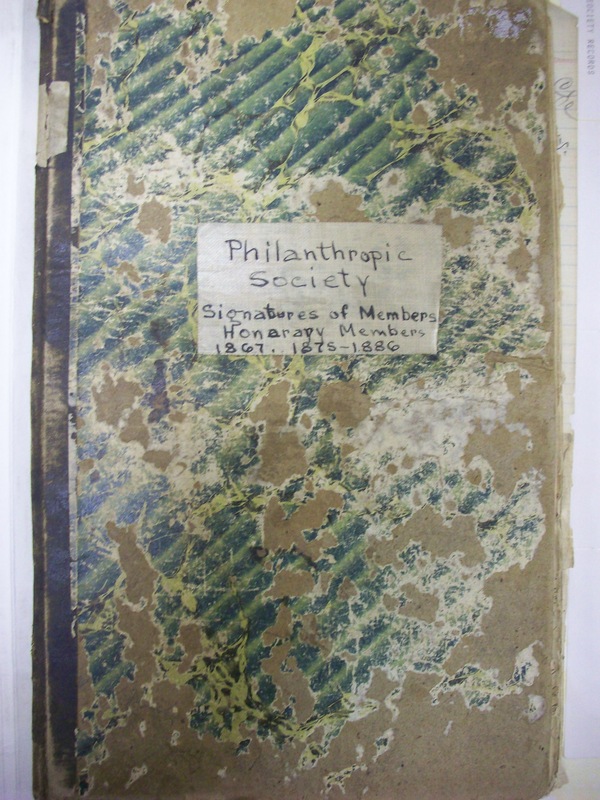 Charles’ father, William F. Askew, received such an honor from the Philanthropic Society during commencement week in June of 1877. According to the society minutes, Mr. Askew was not present at the ceremony due to illness. 3) Photographs taken by me of records from the archives in Wilson Library at the University of North Carolina at Chapel Hill. When I sent for a copy of Bertie Askew’s United Daughters of the Confederacy membership application, I didn’t know what to expect in return. Yesterday, I received copies of three forms. One is her original membership application, for the Baltimore Chapter of the UDC. The other two forms are titled “Demit” and show her moving from the Baltimore chapter to the Robert E. Lee Chapter in East Orange, New Jersey and then to the Stonewall Jackson Chapter in Glenridge, New Jersey. Do they contain useful information? Yes! Those women not less than 18 years of age entitled to membership are the women who are the widows, wives, mothers, sisters, grand nieces, and lineal descendants of such men as served honorably in the Confederate Army, Navy or Civil Service, or those men, unfit for active duty, who loyally gave aid to the Cause. Also Southern women who can give proof of personal service or loyal aid to the Southern Cause during the war, and the lineal descendants or nieces of such women wherever living. Northern women having no male relative who served the Confederate States of America in the War Between the States, 1861-1865, and having themselves performed no special service to same, but having married a Confederate soldier since 1865, and through this means becoming a member of the United Daughters of the Confederacy, shall have the words “by adoption” placed upon their certificates of membership and upon the Registrar’s books . . . In her initial application for membership, Bertie gives information proving her relationship to a confederate soldier. She states that she is the granddaughter of Col. W. F. Askew of Raleigh, a colonel in the Commissary Department located at Raleigh, North Carolina. Furthermore, she is a great niece of W. H. Moore in the North Carolina Cavalry. Her birthdate and location are, unfortunately, left blank. She signs her name “Bertie Askew Henderson (Mrs. D. M. Jr.) and gives her address as 2113 Guilford Ave., Baltimore. To be admitted to the UDC, she must receive recommendations from three members. She lists S. A. Williamson, Rebecca Marshall and E. R. Beall She was admitted to the chapter on November 6th, 1906. At first glance, the new information contained in this application may seem to be scant, but it does provide support for her placement in our family tree and introduces a new name, W. H. Moore. 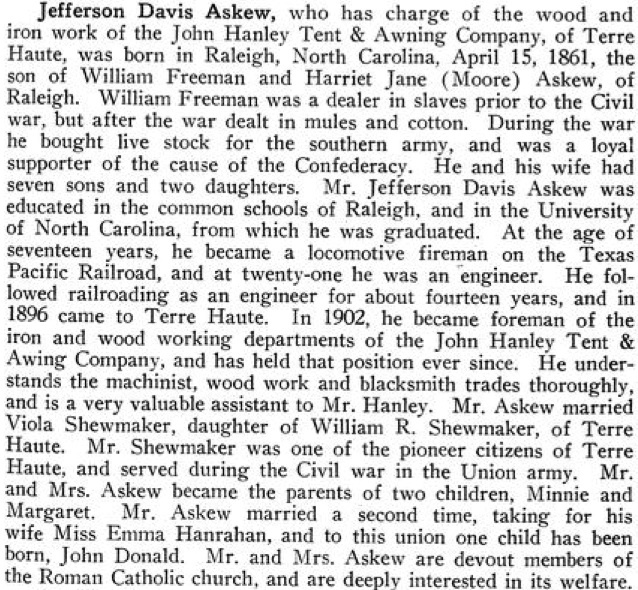 If he is her great uncle, then he is likely to be a brother-in-law to William F. Askew, her grandfather. Here is a clipping from the 1850 census of Wake County, North Carolina, showing Wm. F. Askew and his wife, Harriet Moore (More), living with her father, John C. Moore (More) and brother, William. Putting together the information from these census pages and his Confederate service record might lead to new information about the Moore family. The other bit of information worth pursuing is William F. Askew’s service in the Commissary Department during the war. What was his role in the department? How did he obtain the rank of colonel? Did he form relationships during this time that helped him after the war was over? It looks like I’ll be learning something about Confederate Service Records and making a trip to the North Carolina State Archives. On May 8th, 1922, Bertie transfers her membership to the Robert E. Lee Chapter, East Orange, New Jersey. Her name is listed as Bertha Askew Henderson (Mrs. Daniel M.) This form lists her date of birth as December 29, 1883 in Raleigh, North Carolina. Both Col. Wm. F. Askew and W. H. Moore are named, but next to Moore’s name is written “41st State Troops, CSA, Co. A, 3rd NC Cav.” As this was written by hand and most of the other information is typed, this must have been added later. A quick search online shows that the history of the 3rd Cavalry is widely known, but also turns up more than one W. H. Moore in their ranks. Further research will be necessary to determine whether or not the information given on the UDC form is correct. Her transfer to the Stonewall Jackson Chapter in March of 1932 states that she was the founder of the Robert E. Lee Chapter of East Orange and is a charter member of the Stonewall Jackson Chapter. Her name is again written as Bertha Askew Henderson. Perhaps she used “Bertie” as a nickname when she was younger, but resorted to Bertha as she matured, as I have done with my name. People who have known me more than 25 years still call me Laurie, but I began using my given name, Laurel, when I wanted to be taken more seriously in business settings and continue to use it today. Organizations like the UDC provided women with opportunities for accomplishments outside of their traditional roles as mothers and wives at a time when most women did not work outside the home, and for forming friendships with a common bond. The objectives of the UDC include preserving the history of the War Between the States, assisting descendants in obtaining an education by providing scholarships, and honoring those who served. Mounting evidence supports the theory that Charles Thompson Askew married twice. 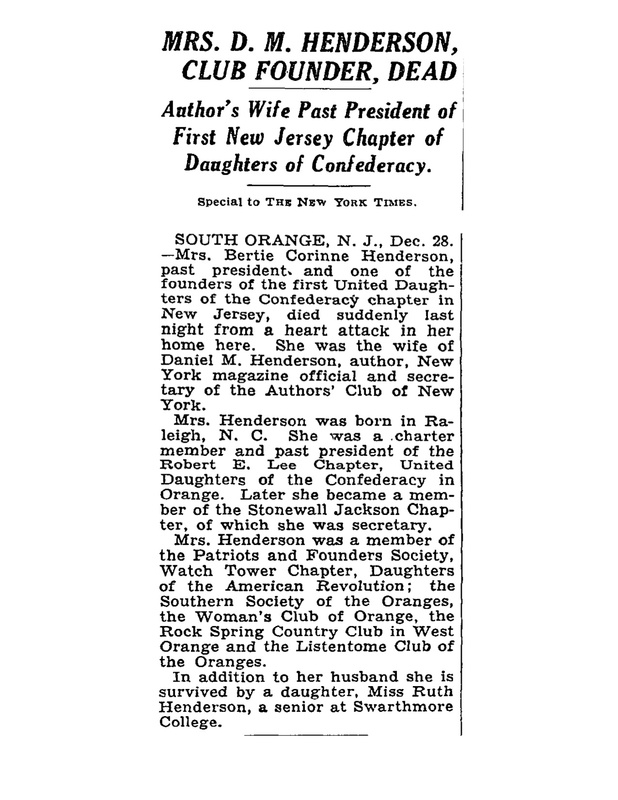 Although his obituary mentions a wife, Edith, and a son, Charles, I have found additional information proving an earlier marriage to Leila Dodson and the birth of a daughter, Bertie. Besides the marriage announcement mentioned in my first post about Charles, new information sheds light on his first wife and daughter. Married in December of 1882, Charles and Leila were no longer living together by the time the 1900 census was taken. The 1890 census would be helpful, but it was almost completely destroyed by fire and by bureaucratic ineptitude. Fortunately, more and more newspapers are being digitized and made available online, either through subscription services or through library websites for free. A newspaper article from the Baltimore Sun, February 27, 1895 lists Charles T. Askew, Mrs. Charles T. Askew and Miss Askew, of Brooklyn, New York, attending the Drew-Hodson wedding in Baltimore. This is consistent with what we know of his employment history, which places him in New York around this time. It means Charles, Leila and daughter moved to New York together. We can only speculate about why their lives soon changed. Here is a clipping from the 1900 census for Baltimore, Maryland. It shows (reading the columns from left to right) Leila Askew, head of household, White, Female, born October 1858, age 41, Widowed, mother of one child, one child still living, born in Maryland, her father born in Maryland, her mother born in Maryland. On the next line is Bertie Askew, daughter, born July 1883. That Leila is listed as widowed could mean several things: she could be widowed, she could be divorced, or she could be abandoned. First, we don’t know who gave this information to the census taker. Second, divorced women often preferred to be known as widows in an era when divorce carried such a stigma. Third, a divorce was difficult to obtain. I cannot find Charles in the 1900 census. It’s possible he wasn’t counted because he was traveling as a paper salesman at that time. The 1910 census shows Leila Askew, mother-in-law, living with Daniel M. Henderson and Bertie C. Henderson. It also shows that Bertie and Daniel have been married for 5 years, and that Daniel’s parents were born in Scotland. Interestingly, Leila is listed as having been married 2 times, with the present marriage of 27 years duration, and as having had 2 children, with one still living (Bertie, of course.) Census data can never be presumed to be fact without further proof, however it raises the possibility that she may have been abandoned and never divorced. She may have been married to someone else before Charles. Perhaps Bertie had a brother or sister who did not survive. In 1920 Leila is again listed in the census as a widow, and Daniel and Bertie have a 5-year-old daughter named Ruth. They are living in Orange, New Jersey. I have no further information about Leila. More proof is needed to confirm the link between Daniel and Bertie Henderson, Leila Askew and Charles T. Askew (son of William F. Askew of Raleigh.) What we have so far relies on census data and needs to be corroborated with additional evidence. Bertie Corinne Askew Henderson joined the Baltimore Chapter #8 in Baltimore, MD on November 6, 1906. She transferred to the Robert E. Lee #1773 in East Orange, NJ in 1922, and then transferred to the Stonewall Jackson #2058 in Glenridge, NJ in 1931. The transfers state that she was the Founder of the Robert E. Lee Chapter and a Charter Member of the Stonewall Jackson Chapter. I’ll be happy to make a copy of the application for you; our charge for a copy of an application is $16.00. Her Confederate Ancestor was Col. William F. Askew, her Grandfather. Is this enough proof to consider the case closed? I could pursue additional records, but I am satisfied that the question of whether or not Charles T. Askew was married to Leila Dodson has been answered. New York, New Jersey and California are locations that appear frequently in our family history. Coincidence, or something more? Here is a question for YOU to answer: In Bertie’s obituary, Daniel M. Henderson is mentioned as an author and New York magazine official. What did he write and how famous (or infamous) was he? When you find out, leave your answer in a comment on this post!